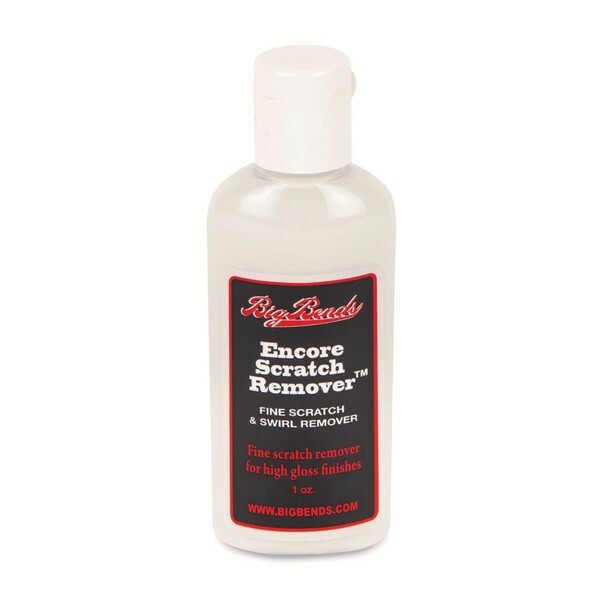 Big Bends Encore Scratch Remover is a clear coat swirl mark and fine scratch remover. This revolutionary formula is ideal for rejuvenating your instrument's finish that may have dulled or acquired fine scratching over time. Other excellent uses for Big Bends Encore include acquiring a silky smooth neck or refurbishing scratched pickguards. This swirl mark and fine scratch remover contains absolutely no wax or silicone, and is ideal for use with other Big Bends guitar care products for a showroom quality finish.